Remove brake dust and fallout from your paint and rims! Mist, let dwell, rinse away, it is that easy! 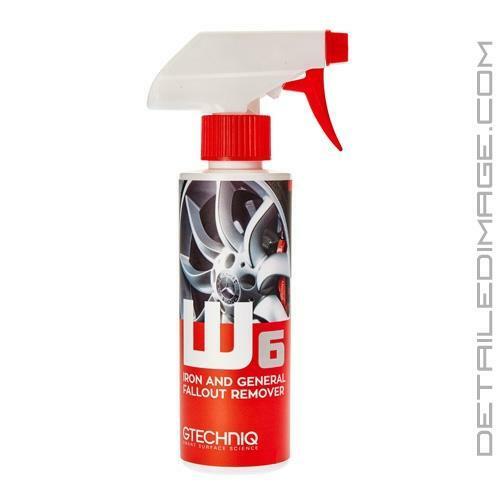 The Gtechniq W6 Iron and General Fallout Remover helps dissolve harmful fallout and brake dust fast and easy! This thick gel-like formula is easy to spray onto the surface and it clings, allowing the formula to stay on the surface longer. This allows the high quality formula to remove more fallout than other liquid formulas that run down the surface too fast! For any heavily contaminated areas we recommend agitating the surface with a clean wash mitt or sponge. After application, be sure to rinse the paint thoroughly. W6 will leave your paint or wheels cleaner than before and ready for you to polish or apply a wax or sealant. Rust deposits, industrial dust, lime deposits, brake dust, and other contaminants are no match for this strong formula. Even though it is strong, it is still pretty gentle. According to Gtechniq it will not damage any coating that you already have applied. This makes it a great maintenance product for your coated car! In addition to the fantastic cleaning capabilities, W6 has a corrosion inhibitor in the formula, which is an additive that is designed to combat the effects of acid rain. So what are you waiting for, thoroughly clean the surface of your vehicle with the Gtechniq W6 Iron and General Fallout Remover! W6 Iron and General Fallout Remover is formulated to offer you the safest and most effective method of removing potentially damaging fallout found on your vehicles paintwork and rims. In addition to its exceptional fallout removing function, W6 also has a corrosion inhibitor, plus an additive designed to combat the effects of acid rain. It is a thick gel-like formula that will cling to vertical surfaces. Use in a well ventilated area out of direct sunlight as the product has a very strong and unpleasant odour. Spray W6 directly onto the surface and allow to dwell for 5-10 minutes. Any ferrous particles will dissolve forming a purple solution. Do not allow product to dry on the surface. Rinse residue and repeat if necessary. Works great just keep away from plastic and truck bed covers. Best product I ever had for wheels cleaning application. W6 proved very effective in the removal of iron and grime on the wheels. If you can get past the awful smell, you should be happy with results. Wish it went a bit further with the size of container. I thank you. One thing I can say is that I love your company and the customer service is outstanding.